Fair Value for Financial Reporting highlights the accounting and auditing requirements for fair value information and offers a detailed explanation of how the FASB is going to change "fair value" with topics including: the FASB's fair value proposals; determining the fair value of intangible assets; whether fair value can truly be audited; valuation of liabilities and contingent payments; valuation of hard assets and real estate; why two appraisers come up with different results; auditing of valuation reports; and selecting and working with an appraiser. Alfred M. King (Spotsylvania, VA), CMA, is the Vice Chairman of Marshall & Stevens, a national firm of appraisers. He is also a past Chairman of the Accounting Committee of the Institute of Management Accountants. Intended Use of Intangible Assets: “Market Participants”. Value In-Use versus Value In-Exchange. FASB’s New Approach to Liabilities: “Expected Value”. Sarbanes-Oxley Required Controls on PP&E. CHAPTER 10. In-Process Research and Development. Development of In-Process Research and Development. What Is a “Reasonable Profit”? 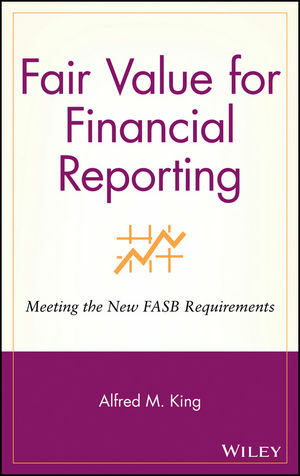 Provides a detailed explanation of how the FASB is going to change "fair value". Examines FASB's proposed changes toward the treatment of fair value. Discusses how corporate liabilities must now be valued (e.g., lawsuits and contingent payments). Discusses valuation of financial instruments. Shows how valuations must now be prepared in a manner consistent with GAAP and current SEC interpretations.